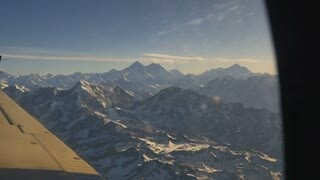 Search Results for "everest aerial"
Aerial view of mountain peak against clear, blue sky. Mountain landscape. Aerial shot of Mount Khumbila from Helicopter in Khumbu Valley, near Tengboche Monastery. Aerial shot of Kunde and Khumjung, Nepal, from helicopter towards Lukla. Small twin otter plane flying out of Luka, Nepal.